India coach Michael Nobbs today apologised to the hockey fans of the country, saying the players had let the nation down with their insipid display as the team slumped to its fourth successive defeat in the Olympic competition, here today. "The players have failed to perform. Call it pressure of whatever, the have let themselves, the team and the country down," Nobbs said after India's 1-4 loss to South Korea. Today's defeat has left them at the bottom of Pool B, pushing the eight-time gold medallists to the lowest ever ranking in the Olympics. India's previous worst show was at the Atlanta Olympics in 1996, when they finished eighth. The new rules for positional play-offs mean there will be a direct encounter between the teams of two pools who do not make the semifinals. In effect, this means India will play for the 11th and 12th places with the bottom-paced team in the other pool. India is the only team in the Olympic men's hockey competition not to have gained a point in four matches. Even if India win their last pool match against Belgium, they will still finish at the bottom of the group because all other teams in the group have four of more points. All teams have a chance to improve their positions and just one thing is confirmed yet, that India will finish at the bottom. 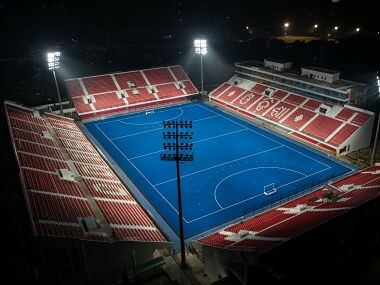 Coach Nobbs said the Indian hockey fans ought to be disappointed with the performance of this team, which not only failed to secure a point, but did not show the heart for a fight. "I owe an apology to the nation and the Indian fans for letting them down," said Nobbs, apparently disgusted with the poor show put up the team that he took over 11 months ago. "You just get one chance in a lifetime and you just cannot walk out without performing," said Nobbs. Former Indian international Mohammed Riaz, the assistant coach, said the team missed several chances before crashing to defeat against the Koreans. "We played a bad first half and then put up a better show in the second session, but we missed seven chances in this match," said Riaz. Indian captain Bharat Chetri said the Indian players had repeated mistakes one match after another. "We're making silly mistakes, out trapping the circle was poor and we missed several chances because of this," said Chetri. "Even our penalty corners are not producing goals as Sandeep Singh and V Raghunath have been off-target. We are a young team that does not have the experience of big events like the Olympic Games," he said. "Look at our trapping, such poor performance is not expected from the team." South Korean player Jang Jong Hyun said the Indian players began tiring in the second half and gave them a chance to breach their defence. "I think the Indian players were getting really tired and we could feel that so we decided to attack even harder to take advantage of their weakened position," Jan said.